During the past couple of years there has been a major change in the demographics of home-audio buyers. Between 2013 and 2015 the amount spent by individuals 55 and older dropped by 50%—from 36% of the market to only 18%. During this same period spending by 18-to-24-year-olds increased from 10% to 17% (a 70% jump), while spending by 25-to-34-year-olds also saw an uptick from 19% to 30%. If you combine the spending power of 18-to-34-year-old buyers, you’ll find that they purchased over 47% of all home-audio gear. Since headphones and portable playback devices have been the industry’s biggest growth areas, no need to ask who is doing most of the purchasing—those 18-to-34-year-olds. Manufacturers, especially loudspeaker makers, have noticed these changes in buying habits. In the last couple of years B&W and PSB, among others, have fielded headphone designs. Focal, known not only for its loudspeakers but also for its raw drivers, entered the arena several years ago with a line of portable “lifestyle headphones.” Recently the company announced two new reference models, the Elear ($1000) and Utopia ($3999). Both are all-new open-enclosure designs featuring Focal’s own driver components. The Utopia uses a beryllium driver while the Elear uses an aluminum/magnesium one. Except for the driver material and some cosmetic differences in their earcups and headbands they share the same technology. This review will focus on the Utopia. The Utopia headphone is based on an entirely new driver design. The engineering goals were simple, yet difficult to achieve with current-production conventional drivers. 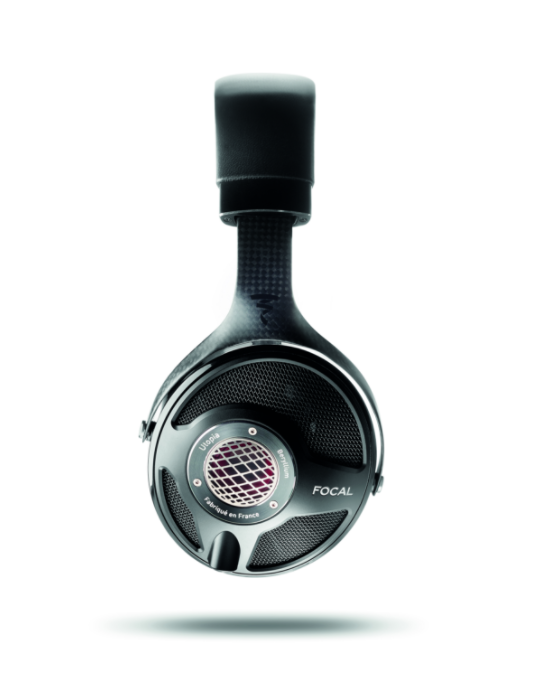 According to Focal its goal was to “design a full-range loudspeaker, fully open both front and back. Additionally, we wanted it to be compact enough to fit in an ear cup of a fully open pair of headphones that could perform with the lowest possible distortion.” To achieve this, Focal needed a driver material that had “the lowest possible mass to preserve the signal’s dynamic…to avoid distortion, and to achieve high damping.” Beryllium was chosen due to its innate characteristics—its density is two-and-a-half times lower than titanium and one-and-a-half times lower than aluminum, while its rigidity is three times higher than titanium and five times higher than aluminum. On a domed tweeter with identical mass, a beryllium tweeter is seven times more rigid than a titanium tweeter. The Utopia also uses a specially designed voice coil that weighs only 135mg. To accomplish this, Focal created the first voice coil without any support (to get the lowest possible mass)—one that’s also twice as large as the competition. Focal’s engineers were able to create a 5mm-tall voice coil with a 25mm diameter that was lighter than a 1.5mm-by-15mm voice coil. Even Utopia’s surround material had to be engineered from scratch. After trying several raw materials such as PE, Mylar, fabric, and silicone, Focal found that the only one able to reach both compliance and mass targets was NBR, which combines softness, lightness, and mechanical linearity. In the end, Focal came out with a surround almost three times thinner than that of the competition—75 microns compared to 200 microns. Focal also invested a great deal of time, effort, and research in the Utopia’s enclosure. It chose to make the Utopia an open design so it would have the least amount of physical impedance. Because it is an open design, the Utopia depends heavily on the ear cushions to control “the listening room experience.” The Utopia cushion is made of two raw materials: real lambskin leather and perforated fabric. The inner part is composed of a 50/50 ratio of lambskin leather (diffusion) and fabric (absorption). Focal says that “during the development process, we also did a lot of benchmark testing and found out that all the headphones equipped with leather cushions only ensure good performance from the low-to-mid frequencies. They always have problems with linearity in the upper part of the spectrum (from 1kHz to 10kHz).” To avoid reflections a fabric with punched micro-holes was used inside the cushion to fine-tune the absorption ratio. Most over-the-ear headphones have their drivers placed parallel and in line with the listener’s ears, but Focal found that it achieved a better result by positioning the Utopia’s drivers as far forward in the enclosure as possible. This also has the advantage of reducing the distance between the drivers and the ears. The Utopia is an extremely comfortable headphone due to its overall design. Its carbon-fiber yoke is light yet strong. It uses a sliding click-stop expansion system that is easy to adjust yet holds settings well. And unlike many other ’phones where the side-pressure is greater on larger-diameter heads than smaller ones, the Utopia’s pressure remains the same regardless of head size. The only complaint I have with the Utopia’s fit is that if your head is smaller than my 7 1/8, you may find that even with the headband set to least extension the ’phones could sit a bit too low on your ears. That said, placement was perfect for me (and should be fine for anyone with a larger noggin). I found that I could wear the Utopias for as long as I wanted with no discomfort or fatigue. On a few rare occasions (while using the Darin Fong “Out of Your Head” playback software, which successfully simulates loudspeaker imaging), I occasionally forgot I had the Utopia on my head. As you would expect from a premium headphone the Utopia has a removable cable. It uses a Lemo connection with a self-locking bayonet configuration. It’s a good thing that the stock cable is removable because the cable is the Utopia’s only serious ergonomic flaw. It is 13.1 feet long, and not terribly lightweight. If you pace as you listen the cable’s length will be a plus, but for more stationary listeners it is bulky and makes the Utopia into a heavier burden than it needs to be. After a few days using the stock cable, I called Moon Audio and ordered a 10-foot Silver Dragon headphone cable ($530). The Silver Dragon substantially reduced the weight and bulk of the Utopias and made my time with them far more comfortable. When you consider that many earphones at one-tenth the Utopia’s price include several sets of cables, I can only wonder why Focal chose to be so parsimonious with cable options. With a sensitivity of 104dB and impedance of 80 ohms the Utopia doesn’t require a mega-powered amplifier to produce satisfying volume. Even a smartphone such as my iPhone 5 had no trouble driving the Utopia to what I would call loud levels at its three-quarters volume setting, although a somewhat beefier amplifier (such as the Astell&Kern AK240 or QueStyle QP-R1) will deliver more bass extension and control.